Elegantly poised at the edge of Lake Leman with magnificent views of the famous Jet d’Eau and Mont Blanc, our beautiful boutique hotel showcases British charm with the finest Swiss hospitalily.Enjoy exquisitely decorated rooms and suites, delicious international cuisine in Windows restaurant, and cocktails in our famous Leopar Bar and Cigar Lounge. 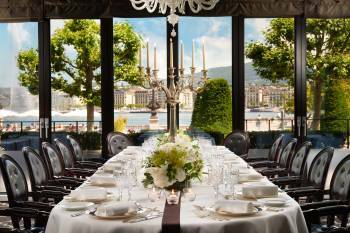 A successful event requires a suitable impressive and remarkable venue – and Hotel d’Angleterre really fits the bill. Overlooking the sparkling waters of Lake Geneva and with grand interiors, exceptional service and a choice of rooms to suit your requirements, the stage is set for success.Choosing the Hotel d’Angleterre for your meeting or events means you’ll have access to a range of services and technology, including complimentary wireless broadband internet access throughout the hotel.